Russian plane crashes in Egypt, killing all 224 people aboard. 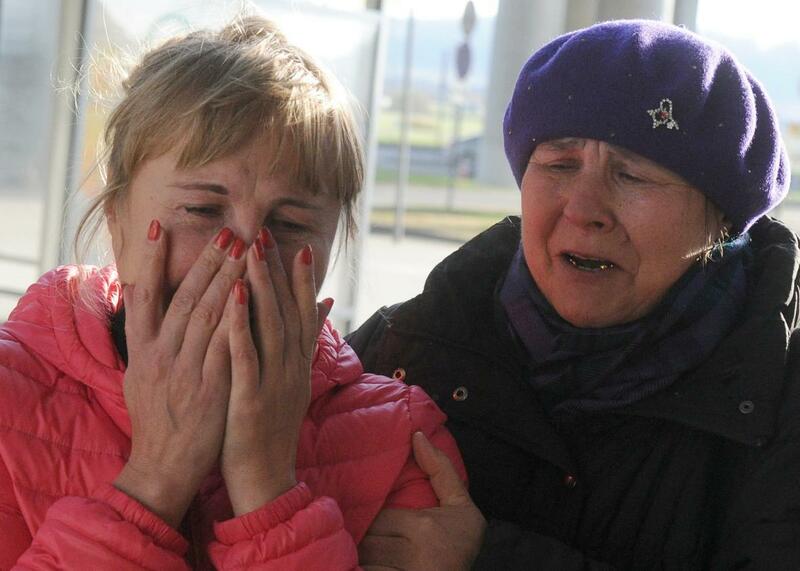 Relatives react at Pulkovo International Airport outside Saint Petersburg after a Russian plane with 224 people on board crashed in a mountainous part of Egypt’s Sinai Peninsula on October 31, 2015. Update: ISIS has claimed responsibility for downing the Russian plane that crashed in Egypt’s Sinai Peninsula, killing everyone aboard, but has offered no evidence to back up its claims, and it’s far from clear it even has the capability to carry out this type of attack. Russian Transport Minister Maxim Sokolov has dismissed the claims of responsibility and told the Interfax news agency that the reports “must not be considered reliable,” according to the New York Times. Original post at 10:16 a.m.: A Russian airliner carrying 224 passengers and crew members, including 17 children, crashed in Egypt’s Sinai Peninsula Saturday, and officials say there appear to be no survivors. The Russian Embassy in Cairo corroborated those findings by writing on Twitter that all of the passengers, made up of 214 Russians and three Ukrainians, had been killed. The Russian airline Kogalymavia was operating the Airbus A321 under the brand name Metrojet, and was flying from a Red Sea resort popular with Russian tourists to St. Petersburg when it crashed in a mountainous region early in the morning, reports Reuters. Two flight-tracking websites posted data showing how the plane began descending rapidly all of a sudden, for no apparent reason. The crash took place only 23 minutes after what seemed to be a smooth takeoff, reports the Associated Press. Flight radar data makes clear there was a flight upset, but we have no idea why. There are loads of terrorist factions operating in the area and many affiliated to Islamic State. The Egyptians work very hard on security at Sharm El Sheik because if you wanted to destroy the tourist economy that would be the likewise target. However the plane was too high for a shoulder launched missile, but it was 2,000 feet lower than MH17. Still, the plane “appears to have come down in one piece, unlike MH17,” Learmount added, referring to the Malaysia Airlines flight that was shot down while flying from Amsterdam to Kuala Lampur last year. Russian media outlets are reporting that the pilot called in technical problems and requested to land at the nearest airport before it suddenly vanished, notes CNN. Russia’s RIA news agency reports that a criminal case has been opened against the airline for “violation of rules of flight and preparation for them,” according to the BBC. But Kogalymavia insists so far there are no grounds to blame human error for the crash, noting the pilot had 12,000 hours flying experience and the plane had recently been fully serviced. At the scene, search-and-rescue workers found more than 100 bodies almost intact, adding that many were still strapped to their seatbelts. “We are hearing a lot of telephones ringing, most likely belonging to the victims, and security forces are collecting them and putting them into a bag,” a security officer said. Airbus said the aircraft that crashed was 18 years old and had been operated by Kogalymavia since 2012. The plane had accumulated around 56,000 flight hours in 21,000 flights.